How do we solve climate change? As opening questions go, it’s a biggie. It’s also a question loaded with optimism and arguably childlike naivety; it implicitly makes the assumption that climate change can be solved, and that humankind is capable of a collective effort to do so. 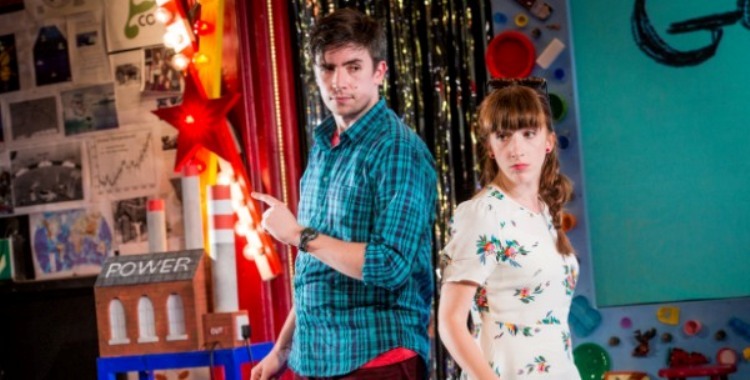 But Tonic Theatre’s new children’s show is far from blindly optimistic. The show begins in fairly predictable if entertaining style, explaining global warming using jumper and blanket metaphors and recruiting the audience to throw around paper planes. Familiar explanatory techniques are deployed and people are plucked from their seats to recap what we’ve learned. This is smarter, however, than your average Newsround segment. Once the initial explanations are out of the way, a tension quickly emerges between optimism and pessimism, staging a latent debate about how best to present these ideas. Should we face up to the impending disaster we are wreaking on our planet, as Joe’s litany of catastrophes suggests we should, or should we stick with Becci and keep things fun? Is fear enough to make us change, or do we need to remain stubbornly positive despite the odds? Similar tensions rear their head when we reach the solutions half of the show, which proves much harder than simply getting across the facts. The responses of world leaders are lightly hinted at in a section entitled “the blame game”, while Joe and Becci echo all our secret, selfish reactions to the suggestion that we might need to change. Complexity is embraced rather than skirted around, as possibility follows complication follows possibility. Each solution that is proffered is countered with a disadvantage, refusing to underestimate its young audience’s grasp of these thorny questions. Variety, however, ends up being one of the show’s greatest strengths – in more than one sense. Aesthetically, the piece is colourful and richly textured, brushing off any residue of tedium that might have attached itself to the lecture format. The pace is brisk and the tools of performance are abundant, from sound to video to audience interaction, ensuring that the attention of young (and older) audiences is not allowed to dip for a second. Multiplicity also ends up being the vital saving grace of the ever more desperate answers that Joe and Becci throw at us. Each can be undermined, but we also have the choice to make these changes, to do what we can no matter how small, and – most importantly – to try. Perhaps unsurprisingly, the central question is never quite answered. Climate change comprises a complex web of different causes and is – as this show reminds us with remarkable simplicity – symptomatic of the systems that order our lives. To suggest that there is a miracle cure would be patronising, misleading and ultimately irresponsible. Instead, there are multiple different answers, which it is up to us to wade our way through. Rather than imagining their future for them, the show asks its audience to imagine a different future for themselves. And therein, perhaps, lies its power.